Hand made from quarter sawn sapele. I had some camel bone (who doesn’t), so I used that for the white inlays and the black inlay is ebony. The centre markers are inlaid with New Zealand paua abalone and white mother of pearl. The sticks are 16” long x 1 1/4” high and 1” deep. The front faces are angled up to reflect the overhead lighting. The finish is one coat of boiled linseed oil and two coats of Briwax clear wax. 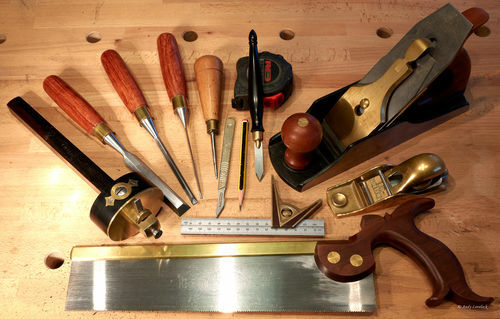 The following photo shows the tools used apart from the Stanley 607 which I used to flatten the top and bottom faces. This was an enjoyable project to do with hand tools and the first time I’ve ever done any kind of inlay work. Sapele isn’t the easiest wood to inlay because of the open pored structure but I’m quite pleased with the results. Precise and appealing, Andy. Awesome job! Very nice, Andy. I like the inlay. The BLO doesn’t darken the white? I used white holly and I haven’t finished them for fear of messing up the white. Bob – Less is more. Gold would have been far too ostentatious. Kev – I applied the BLO around the camel bone carefully with an artist’s brush which seemed to work ok and I didn’t purposely put wax over the bone either. The abalone and mother of pearl inlays were done after the BLO had dried. Very nice Andy, well made and up to your usual very high standard. Real Purity, mine are simple Jatoba and birch or Maple, have found that over the changing seasons there is some warping/deflection? Could of been the design, quick pass over the jointer problem solved! Thanks Andy, I’ll try that. I cannot remember seeing a better looking pair of winding sticks, not to mention potentially more expensive as well. Trade offs, your bank, your choice. I’d say you chose well. Andre – I’m sure mine will move too over time, but like you say a couple of passes with the jointer will sort it out in no time. Steve – Thanks for the compliment. It was fun. Nice sticks. I particularly like that you included the tools used display. I’d be afraid to use something that looks so nice. Wow!!! And of course, camel bone is one of those things you pick up on Amazon?? Actually you can buy it on Amazon, but I think mine came from an online tool store in Germany. I’ve got no idea what I bought it for originally, but I thought I might as well use it.